Protect sensitive information in an EZ Home and Office lockbox. Store social security numbers, user ids, passwords, and other sensitive information in your own lockbox. Any number of lockboxes can be added and the lockbox key and any information added to the lockbox are encrypted on the database. With 'Select Features' on the Tools Menu you can remove the Lockbox feature and other functions to simplify the program. 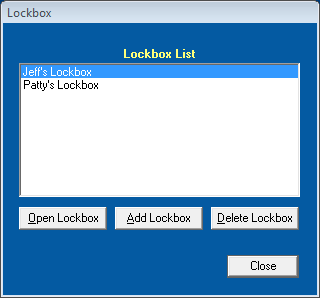 Click on the toolbar or select 'Lockbox' from the Features Menu to display or update the contents in a lockbox. A Lockbox can be used to store User IDs, Passwords, and other sensitive information. Click Open Lockbox to display and update lockbox information. Click Add Lockbox to add a lockbox. Any number of lockboxes can be added. Click 'Delete Lockbox' to delete the selected lockbox. Every lockbox is password protected. 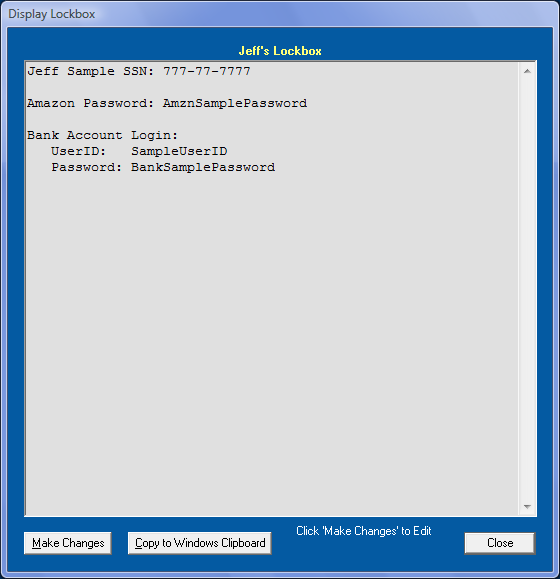 The lockbox password and information are encrypted on the database.